Eric Rogers and Ron Hoblyn, retired Forestry Commission foresters and Woodland Heritage members (right), braved one of the coldest and wettest spring days this year to bring the forestry message to 3,600 school children and their minders at the “Spring Fling” at the Royal Norfolk Showground on 6th April 2004. Many other countryside organisations took part. The children enjoyed themselves filling in a Woodland Heritage questionnaire which entitled them to an Easter egg and hopefully some seeds were sown in their minds which will germinate later. 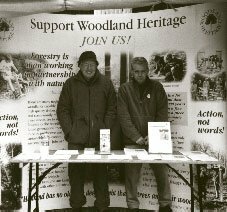 The minders, teachers, parents and grandparents in the main, took an intelligent interest in the message which Woodland Heritage were imparting. It was a pity that the weather forced an early closure.